1. From left to right we have the latest release, the Instant Definition Mascara, £16.00 with its unique dual function brush that sculpts and lengthens lashes, and then defines them with a specially modified tip. 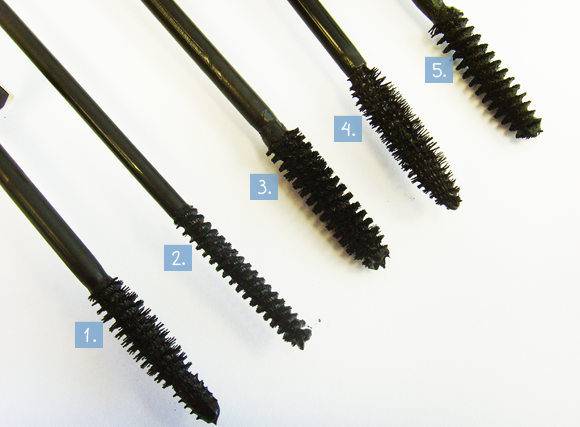 This is perfect for those who have lots of lashes, and want to tame and define them. 2. Next is the distinctive long and thin brush of the Wonder Length Mascara, £16.00 its short bristles perfect for grabbing every lash and building them up with colour and lengthening fibres. If your lashes are short and stumpy but have no problem with volume, this is a great one for you. 3. The third wand along is the bulky, densely packed brush of the Wonder Volume Mascara, £16.00 which loads lashes with an abundance of product and thickens them without clumpiness. This is the closest mascara to a false lash effect that Clarins offers, and is perfect for those with sparse lashes. 4. Next is the Wonder Perfect Mascara, £16.00 a ‘perfect for all occasions’ makeup staple that lengthens, volumises and defines lashes with its fluffy bristles while retaining a natural look. If you want to enhance your sparse, short lashes but don’t want to go overboard, this it for you. 5. Finally we have the more traditional brush of the Wonder Waterproof Mascara, £16.00 a spiral wand that colours and enhances your lashes and distributes the waterproof formulation evenly. Perfect for all lash types, the Wonder Waterproof mascara ensures that your eye makeup stays put. 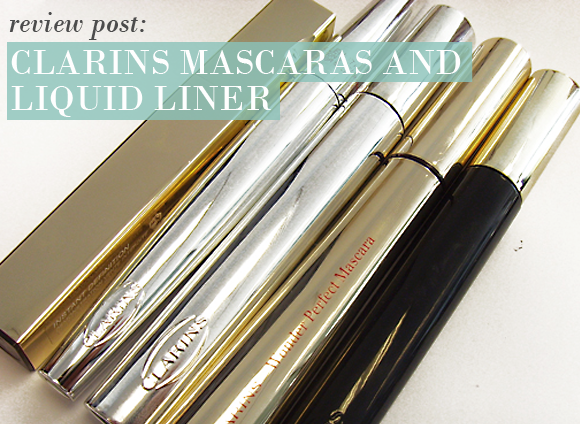 To complement a beautiful fringe of lashes, Clarins also have a super pigmented, super silky black Instant Liner that creates lines, flicks, and tightlines with zero fuss. 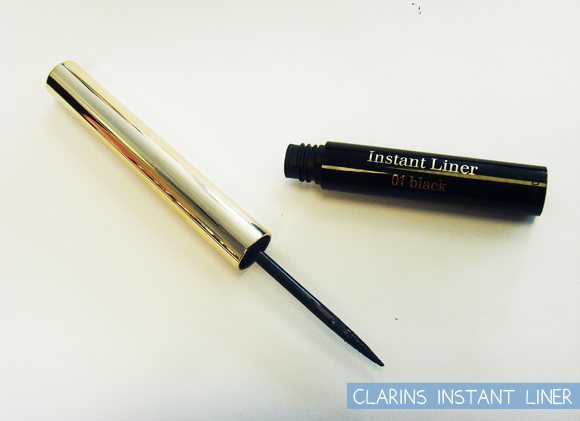 With its sturdy applicator and finely tapered point it’s really easy to get to grips with lining your eyes. 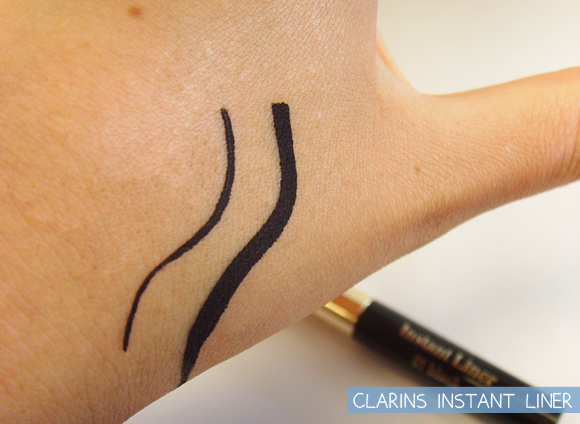 The jet black, matte effect of the liner dries almost instantly, and doesn’t budge until you want it to. It doesn’t bleed, flake or run, and is just perfect for creating both thick and thin lines. A winning formulation! This entry was posted on Tuesday, June 5th, 2012 at 8:00 am and is filed under Hints & Tips, Make-up, Swatches, Tried & Tested. You can follow any responses to this entry through the RSS 2.0 feed. You can skip to the end and leave a response. Pinging is currently not allowed.